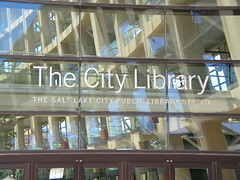 Took our clients to the public library for their first day of photography. This is the single most beautiful library I have ever seen. I love to come here and sit, think, read, drink coffee…do whatever. Whenever I need to get away this is where you will find me. I took some fun shots of things around the library. We were encouraging architectural and design photographs today and I tried to do the same. Take a gander, there are a lot of interesting things hanging around Old Salt Lake.